Section 6: The Amount of Energy Used by Human Society Depends on Many Factors. 6.1 Conservation of energy has two very different meanings. There is the physical law of conservation of energy. This law says that the total amount of energy in the universe is constant. Conserving energy is also commonly used to mean the decreased societal consumption of energy resources. When speaking of people conserving energy, this second meaning is always intended. 6.2 One way to manage energy resources is through conservation. Conservation includes reducing wasteful energy use, using energy for a given purpose more efficiently, making strategic choices as to sources of energy, and reducing energy use altogether. 6.3 Human demand for energy is increasing. Population growth, industrialization, and socioeconomic development result in increased demand for energy. Societies have choices with regard to how they respond to this increase. Each of these choices has consequences. 6.4 Earth has limited energy resources. Increasing human energy consumption places stress on the natural processes that renew some energy resources, and it depletes those that cannot be renewed. 6.5 Social and technological innovation affects the amount of energy used by human society. The amount of energy society uses per capita or in total can decrease. This can happen as a result of technological or social innovation and change. Decreased use of energy does not necessarily equate to decreased quality of life. In many cases it will be associated with improved quality of life in the form of increased economic and national security, reduced environmental risks, and monetary savings. The Energy Star program is run jointly by the U.S. Department of Energy and the Environmental Protection Agency. The Energy Star logo designates products as highly energy efficient. 6.6 Behavior and design affect the amount of energy used by human society. There are actions individuals and society can take to conserve energy. These actions might come in the form of changes in behavior or in changes to the design of technology and infrastructure. Some of these actions have more impact than others. 6.7 Products and services carry with them embedded energy. The energy needed for the entire life-cycle of a product or service is called the “embedded” or “embodied” energy. An accounting of the embedded energy in a product or service, along with knowledge of the source(s) of the energy, is essential when calculating the amount of energy used and in assessing impacts and consequences. 6.8 The amount of energy used can be calculated and monitored. An individual, organization, or government can monitor, measure, and control energy use in many ways. 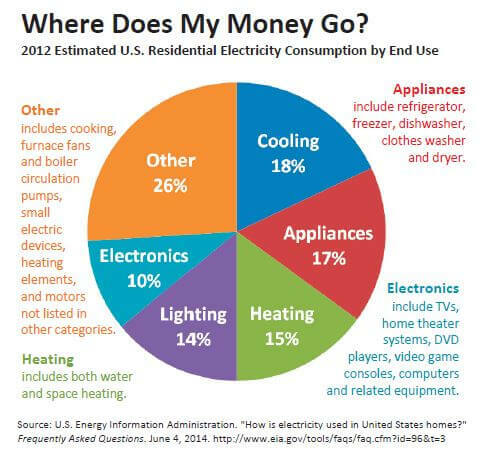 Understanding utility costs, knowing where consumer goods and food come from, and understanding energy efficiency as it relates to home, work, and transportation are essential to this process.